For a Reiki practitioner, it is essential to understand the importance of Chakras in Reiki Healing since the knowledge of Chakras has a great role to play in healing. This is true not only for Reiki, but also for all other forms of Energy healing. While we are sometimes taught that every Chakra has a different function and affects a different aspect of our physical body, in reality, they are all interlinked! Many practitioners, therefore, commit this mistake. They focus on any one Chakra, which they feel is associated with a particular symptom. There is a lot of confusion about the realm of each chakra. Even after having some understanding of Chakras, chances are that we do not remember all the functions of each chakra on their entirely. This puts a lot of pressure on the practitioners. 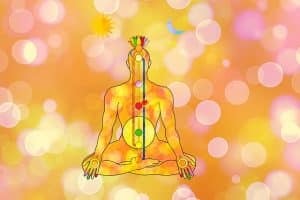 The main thing to understand while going ino any study of Importance of Chakras in Reiki Healing we must remember that this is FREE knowedge of the universe and it will come gradually as you practice sincerely. It will show the desired results once you start practicing earnestly. You don’t have to think too much about the individual characteristics and effect of each Chakra. However here is a key that would help you grasp the essence of what each Chakra does so that you can use the same while adapting the chakra system of healing. Root Chakra: Relates to “safety and security”. Sacral Chakra: Helps you to handle emotions, and also relates to sexuality. Solar Plexus Chakra: fucuses inwards and thus relates to issues connected with ego, determination, and willpower. Heart Chakra: It’s all about Love, compassion, and understanding of others. Third Eye Chakra: Foresight and Intuition. Naval Chakra or the sacral chakra – Deals with creativity, sensitivity, sexuality, and pleasure. Crown Chakra: Higher self and connection with the guru, the divine as well as spiritual guides. 1. The chakra system of healing involves balancing involves a complete session of 24 point reiki meditation. 2. Follow it up with 3 minutes on Third Eye Chakra to bring harmony for the next step. 3. Finish with specific chakra after this eye, as per the ailment. 4. Let your intuition guide you thru the process. Eg. If you have issues of divisiveness and self-confidence, focus on the solar plexus chakra. If you feel lacking sexual energy or similar issues, then focus on Swadhisthana chakra, and so on. 5. Last Step – Connecting with the desired results. In the chakra system of healing, it is very important to visualize the Chakras. Hold on to this image before closing the session as you slowly become aware of the present moment. Thereafter, take a few deep breaths, shake your toes and fingers open your eyes.